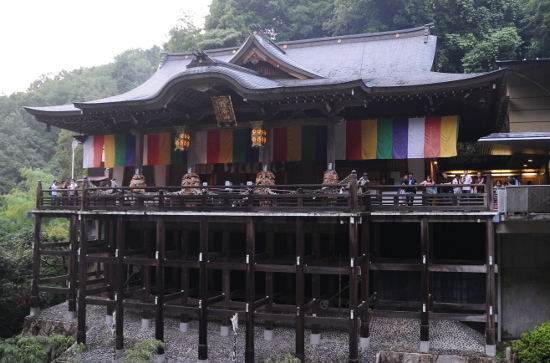 Anyway, I went there last Friday for the hi-watari – fire walking – ceremony. It is meant to pray for protection and health, and it was the longest religious ceremony I have watched so far in Japan. It started with chants and prayers in the main hall, which I could hear but not see because I had stayed outside to secure a good spot for the main part of the ceremony that started about 30 minutes later. 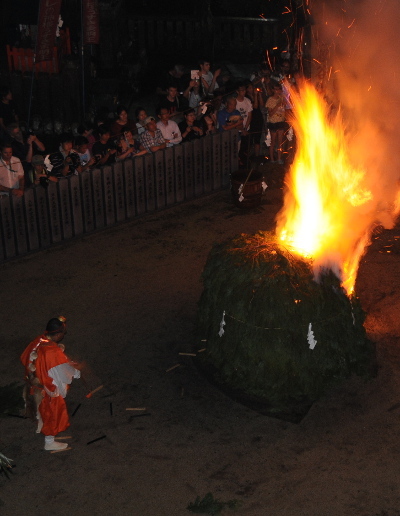 On the central open space of the temple, a large pyre had been built with logs and pine branches. When the monks had finished their ceremony in the main hall, they went down to the “temple square” and took their places there. Four seated themselves at the corners, surrounding the pyre, the others took their seats at some benches that had been specially provided. Then there was more chanting by the monks, and the head priest performed some rituals, the meaning of which I did not understand. At some point, one of the monks took up a prepared bow, went to each of the four men sitting in the corners of the square, took an arrow from them, said an incantation, and then shot the arrow out towards the four corners of the world. A fifth arrow was shot into the pyre. I assume that this part of the ceremony was meant to repel evil coming from the four cardinal directions, but as I said, I am not sure. Only after this was done, the pyre was finally lit with a large torch. More chants and prayers followed, including walking around the bonfire, and the head priest threw bundles of wood into the fire, possibly ema, prayer tablets. This whole part of the ceremony took maybe one hour, and at the end of it, the bonfire was nicely ablaze and its sparks were flying high into the nightly air. When all the chants had been spoken and all the monks had taken their rounds around the bonfire, the fire was torn apart by some of the monks and the wood was formed into a pathway of maybe 6 by 3 meters. The larger logs, still burning, were moved to the outside, and at the inside there was left a layer of glimmering charcoal. And then came the moment all the spectators had been waiting for: The monks lined up at one end of the fiery path – and walked over the coals to the other side. They were accompanied by a large taiko drum, which gave the scene a sort of earnest urgency. It looked very serene, the monks went rather slowly and did not seem fazed at all. A lady next to me, however, remarked that the coals in the middle of the path were completely black by now, meaning they were probably not too hot anymore. Still, it was impressive to watch, and the burning logs at the sides of the path were probably hot enough anyway. 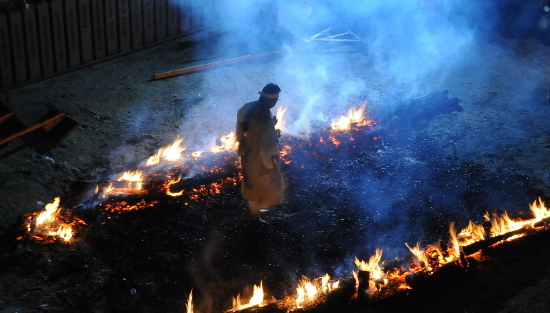 This marked the end of the ceremony, and once all the monks had passed over the hot coals, those who had so far only watched were now also allowed to try fire walking. A large amount of people did, the idea of this part is to pray for good health over summer. 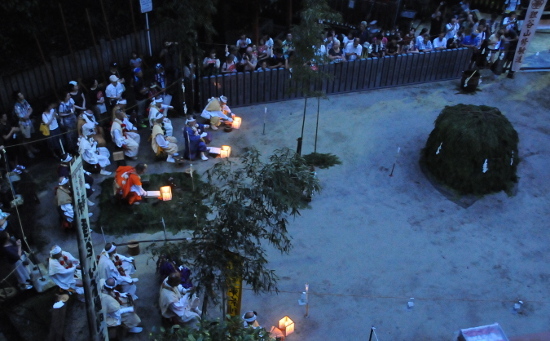 Interestingly, many of the ceremonies that take place in summer are to pray for good health; I wonder if in the olden days people were more prone to die from summer heat (or maybe hot weather diseases) than from whatever cold or pneumonia you can catch in winter. It might explain why most Japanese still seem to suffer less in the cold winter than in the hot summer, even though a too much of both is unpleasant.